Intro: The book-loving blogger (Katherine Sedgwick) describes her latest acquisition, a breezy bio relating the youthful adventures of misunderstood poet, Sylvia Plath. The book is set in 1953, when Sylvia worked at Mademoiselle magazine in New York City. 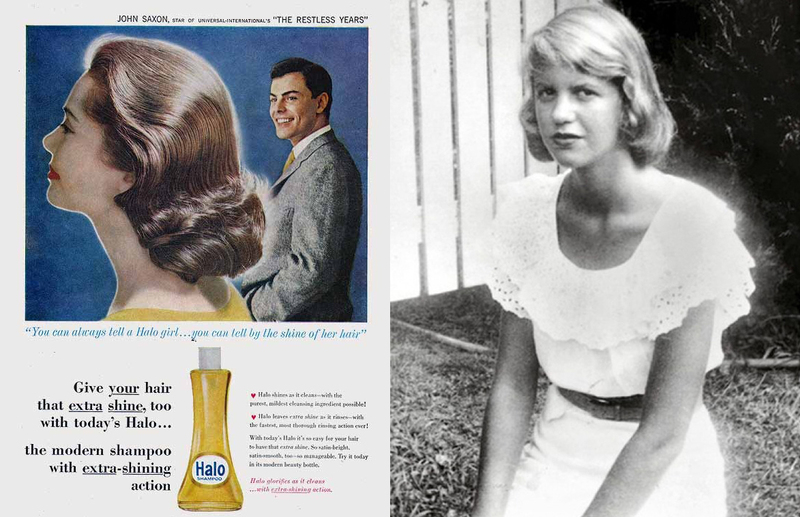 Postscript: a TV commercial of Halo Shampoo from the 1960s. What I like here is how three threads at first seem disconnected (the blogger, an ad for shampoo and the biography of a famous writer). When we learn that the blogger and famous writer both use the same shampoo, it sets off a marvelous nostalgia for youth, ambition and shiny hair. In a few words, we learn quite a lot. Sylvia Plath lives in snob city (she stalks Dylan Thomas, rejects New Yorker writers) while fending off a few stalkers of her own. She works in fashion, but is not defined by it–she may be happy (the signature vodkas) or unhappy (the signature vodkas). We don’t know. I like the name dropping, the hotels, the advertising luncheons, though the entire bowl of caviar (how big was the bowl?) sounds uncomfortable. The overall impression is greatness awaits– portrait of the artist as a young woman, but in the meantime, it’s Halo Shampoo. This entry was posted in Literature and tagged advertising by dougcube. Bookmark the permalink.